Discharges at 45″ into stainless steel stir pot, 60° discharge angle. Wash-down duty stainless steel tubular construction, ends capped, #4 finish, continuous TIG welds. 304 stainless steel pour hood with #4 finish on product contact. Dual quick clean orifice gates. 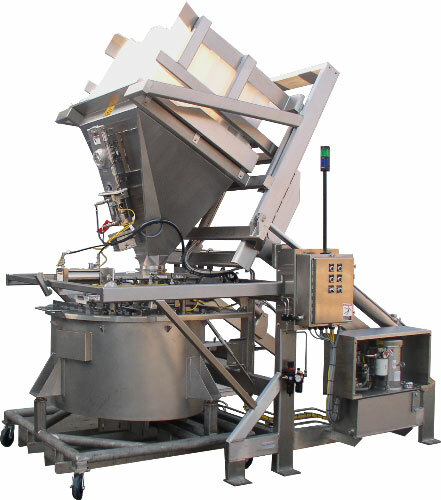 Lift & Seal System™ hydraulically seals container to the pour hood. Equipment capacity rated for 750#. Stack light on the control station indicates operational condition. Many custom safety features and interlocks enhance operator safety. Parker 5 GPM hydraulic system, 10 gallon stainless steel reservoir and enclosure with #4 finish. NEMA 4 electrical components and a NEMA 4X enclosure. Hydraulic system features MTS exclusive two-speed operation for unparalleled control. Hydraulic system powered by a 5 HP TEFC paint-free, stainless steel, wash down duty motor . Allen-Bradley and IFM Efector electricals, NEMA 4X rated Hoffman junction box.